Forward to the roots – back to the future. The Rainbow Project developed from a long journey. In 1967/68 Thomas Bertschi drove with friends across the African continent from Basel to the Cape of Good Hope. A time of new departures - flower power. In the following years, travelling and working in New York, Brazil, Africa once more, South East Asia and, since 1972, mainly in Bali, island of gods and demons. Bali gives experiences of integral interdependencies. In Kathmandu – out of his wealth of travel experiences and impressions Thomas' dream of creating a Life Art Community came within reach. 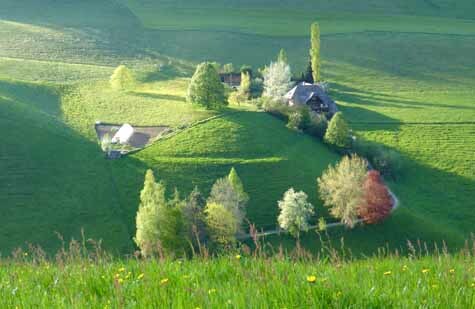 In Sandacker, an old, remote farm house in the Swiss Emmental region, begins the realization of the dreams. In everyday life, the limits between living, working and creating art are dissolving. Over 40 years, the house and its surroundings kept changing as well. Transformation becomes the main theme. People from the Emmental, from Switzerland and from all over the world meet there to exchange ideas, experience, knowledge and talents. In 1989, the Rainbow Project emerged.